Unless you’ve been stuck on Cybertron for the past year or so, then you’re well aware that Transformers: Age of Extinction is hitting theaters this week. Michael Bay’s fourth time helming the blockbuster film franchise has us excited for the massive explosions and striking CGI work that transformed (no pun intended) the last three films huge box office successes—making our favorite living cybernetic organisms relevant again in pop culture. This new installment promises the return of some old favorites and new faces that finally made it to the big screen from the cartoon series and comic books. As the hype continues to grow, we’re expecting fans to get into geek mode from purchasing memorabilia to stepping up their fashion game by sporting some Transformers-themed attire. Well, for those of you planning on going full tilt and making an event of the premiere, let’s ditch the aluminum cosplay suits and don some footwear, kicks that if we didn’t know any better look like they were inspired by some of our favorite Autobots and Decepticons. 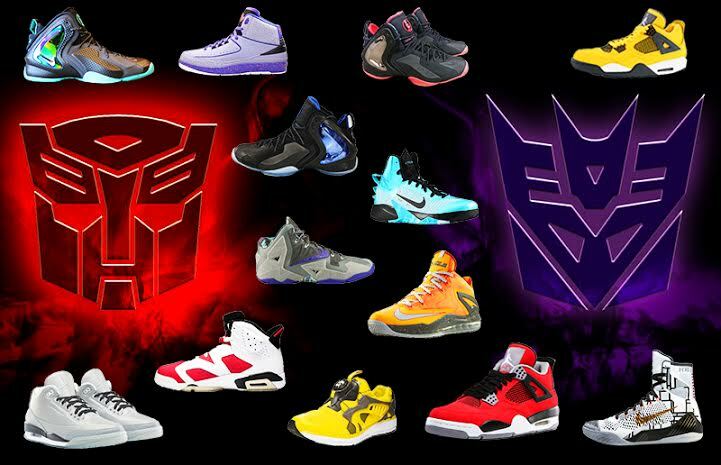 These are the 15 Hottest Transformers-Themed Sneakers Available Now.